Holidays, birthdays, anniversaries, weddings, and other special occasions bring family and friends together in celebration. Yet it is easy to forget that weeks and months of preparation and planning goes into just one day of feasting on delicious delicacies, succulent bite-size entrees and fun entertainment. So when you need to host a get-together, consider having a buffet and your party will be one everybody is raves about for years. Begin planning your buffet with an open mind. This will allow you to choose from a realm of countless options and customize your celebration to your needs. Once carefully thought about, there is not an easier way to accommodate a large group of people and still have a course of action to work with while getting ready for the "big day". We will help you organize your buffet with a few pointers for you to follow ahead of time so when the day finally arrives, you and your guests will be able to share a memorable occasion. The secret to a great buffet is timing. It's best to have a timeframe set for each course you are going to serve. Most people are comfortable mingling for about an hour as more guests arrive and hors d'oeuvres are served. Once your guests have arrived, you can begin to orchestrate the buffet line and the guests can consume the meal; this probably will not take that long. Planning, clearing and serving accordingly will give you the chance to enjoy the party. Unless you are planning to set tables for a formal sit-down buffet, most people will be managing a meal on their lap or while standing (since table space will be at a premium). Your menu should be planned accordingly, leaving out tough meats and most pasta. Instead opt for bite-sized finger and fork foods that will be easy for everyone to enjoy. 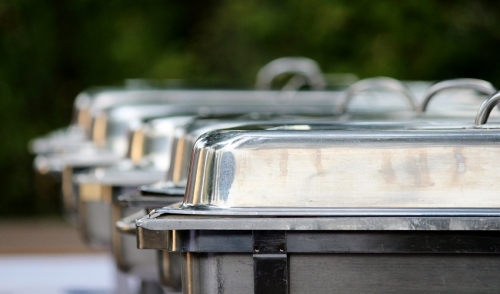 At a larger, less formal party, such as an open house or cocktail buffet, choose edibles that are best served at room temperature unless you have chafing dishes available or servers standing by to refill the hot dishes. It's also best to plan on having more food prepared than not enough to go around comfortably. A good rule to go by is to have one extra portion of each dish for every six guests, since some take more than they could ever finish. Buffets can offer a wide variety of dishes, varying from ethnic fare to delicate pastries and fruits. But most importantly the food must all be easy to eat and not involve a lot of cutting. Whenever you entertain, try to serve foods that you can prepare ahead of time. Endless possibilities are at your fingertips to choose from when planning the meal. Both traditional and non-traditional dishes always go over big at buffets with all the guests. Here are a few ideas that can get you off to a good start while planning your meal. Before the big meal, begin with a few hors d'oeuvres that include the usual staples with an extra touch of elegance. Check out local food specialty stores for tasty crackers or phyllo pastry shells and imported cheeses for an extra tasty treat. These can all be set out before the guests arrive or be passed around on trays once they start to arrive. If you are having a cocktail buffet, more substantial hors d'oeuvres are in order as well. A wide variety of entrees are always a good idea to set out for your guests to sample. Pre-sliced roasts such as roast beef or a turkey or ham are always a traditional stand-by and go great with your choice of potato and vegetable. A delicious option would be to flavor your meat and vegetables with your own blend of herbs and spices to add flavor to the meal. Set out a variety of rolls and breads so your guests can create their own sandwich with the meats available. Depending on the occasion, Christmas cookies, petit fours, and individual tarts are delicious sweets to adorn your sweet table after a big meal. Other delightful desserts include creme brulees, mousses piped into wine glasses, chocolate covered fruits, and mini-pies, all which can be prepared well in advance. Without any exceptions, a seat should be available for every guest you plan on having at the buffet. Even if all seats are not utilized, they are well appreciated by everyone trying to balance a plate and eating their meal! Arrange your furniture temporarily in your living areas to accommodate small groups of people wanting to participate in conversation. It is also best to have a surface nearby for drinks and plates to be placed on when finished. For very informal occasions, small groups of people or for children, the floor makes a great spot to sit as long as you have some large comfy floor pillows to create a seating cluster. The buffet is normally set up on a large surface such as a dining room table or a sideboard. It's best to present an approachable atmosphere for your guests and they will feel comfortable going back for more of your delicious food! The bar should be set up in another room unless your home is constructed with a built-in bar at an area that is made known to all your guests. To avoid high traffic between the buffet table and the bar they should be significantly apart. Ice is a commodity you should have an abundance of for both your alcoholic and non-alcoholic drinks. Some order must be taken at the beginning of the buffet line to make your meal navigable: At the starting end of the table large-sized buffet plates, or regular dinner plates will work fine, should be stacked for easy access, then utensils (a fork, a spoon and only if necessary, a knife). Consider rolling the utensils into a large napkin so everyone can get all they need in one handy package. Follow these with your salads, entrees, trimmings, side dishes, and bread and butter and any condiments. Fill your large serving dishes to the point of overflowing, this gives the impression that you have more than enough food for everyone to come back for seconds and you will not have to worry about refills as often as well. Make sure to keep a cover on and a flame below hot dishes so they don't get cold as quickly.